I want to start off by saying what an exceptionally powerful book this is. Really. It's one of those books that make you think. About yourself. About your life. About others too. It’s very realistic. Everything that goes on in Lia's life is in one way or the other relateable. The whole idea of Anorexia was at first a bit unnerving. Did I want to read a book like this. Even though, it was disturbing it was hard to put the book down. Cassie's death had a great impact upon Lia. It’s fascinating how she believed she was staying strong buy not eating. Her character is conveyed with so much clarity that it’s heartbreaking to read on. Anderson's book is phenomenal. Her immaculate writing delivered Lia’s story beautifully. A definite must read! Oh wow, this sounds like a really strange but good book! Wow, I'll be honest: I've heard amazing things about this book, and yet somehow I never heard what it was actually about. "Did I want to read a book like this"? I'm asking myself the same thing. But from what I've heard (including your review) the answer is yes. I definitely agree that Anderson's writing was incredibly powerful. I was just in awe of the raw emotions that she managed to convey in this book. Great review! Such a powerful book. Loved every minute of it. Wow, what an awesome cover. 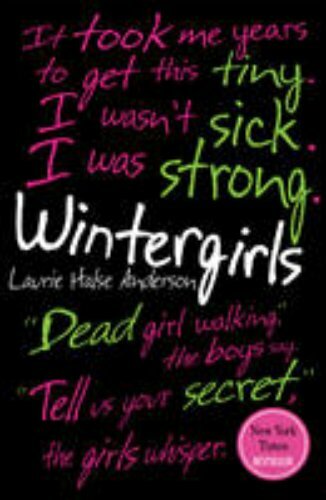 I really enjoy Laurie Halse Anderson's novels. Especially Speak. And I enjoyed the movie as well. I'm sure this one will be just as great. Plus, I like books that make you think about life, and give you something to ponder on internally. I loved this book so much! So glad you did too! Oh, sounds amazingly powerful! I have two books by her: Chains and Forge, that I really have to hear. I really want to read this book. Anderson is such a powerful writer and brings light to so many issues that teens go through. Good to hear that it is a good read and makes an impact. wow! I have no idea that this book is as good as your thought above! I just look at the cover and I think I'll give it a must try! We had a discussion with one czech writer today and she wrote one book about anorexia and bulimia too. She talked about how she met and talked to girls with that disease and it was just so... powerfull. I want to read Wintergirls as much as I want to read the book from that czech writer. This book was so intense I almost hated it. I know how well written it is and that because I had such strong reactions towards it it was well done. But man, it was a hard book to read. Ooh...this one was hard to read. Especially as a teacher and a MOTHER. Not as hard as Speak, but this one was intense as well. LHA is such a talented writer and really gets into the psyche of her narrators...chilling. I've read this book as well, I really enjoyed it. It was kind of hard to read at places because I thought it was a bit dark! this book had such a powerful impact on me because by best friend was anorexic and it hurt me to see her that way, later after she tried to ignore the things i said she told me she wanted help and we got her to some help :) she's all better and healthy it was a good thing we got to stop her before it turned her life around. this is still a great book but i hated the ghost parts, i really really hate them :P great review ! The cover of this book completely jumped out at me! It sounds like an emotional read. Awesome review, I think anything my Laurie Halse Anderson is going to be great--I love how powerful her books are and the messages that we readers can get from them. I have a friend who has an ED, she told me about this book and it's one of the most powerful books on the market. Your review is great! It really describes Wintergirls. This book is a powerful read and your review did it justice. I've stumbled across this book a few times, turning up the opportunity to read it for a fantasy fiction instead... I don't think I'm going to do that again! Thank you for the good review - You've definitely turned one more reader's eyes toward this book.